Research by the University of Southampton is set to investigate the social impact of nuclear weapons tests on British military veterans and their families. Nuclear Families: Understanding the Experiences of the Test Veteran Community is one of five new UK projects1 supported and coordinated by the charity, British Nuclear Test Veterans Association (BNTVA). Each of the projects will examine different aspects of the legacy of tests – addressing medical, psychological and social effects, as well as issues around remembrance. 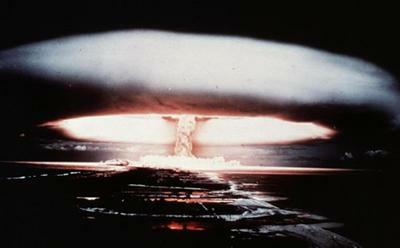 Between 1952 and 1967 it’s estimated over 20,000 personnel from all three branches of the armed services participated in British nuclear weapons testing. The cost to their health and wellbeing has never been fully calculated. The Southampton research will concentrate on how those who took part during the 1950s, specifically in the Pacific region and Nevada Desert (USA), have had their lives changed by their experiences and, in turn, how this has affected their families’ lives. Leading the project at the University of Southampton, Research Fellow Becky Alexis-Martin comments: “Whilst the lives of the nuclear test veterans have been rigorously explored within the quantitative sciences, there has been limited academic research of the nuclear veteran family community within the social sciences – which I hope to address with this project. The study will use a number of different methods to gain a greater understanding of the social effects families have experienced – reviewing historical literature and conducting focus groups and semi-structured interviews. It will examine themes such as, well-being, welfare, family dynamics, mental health, disability and stigma and will concentrate, in part, on the ‘family experience’. All five projects are being funded by grants from the BNTVA’s Nuclear Community Charity Fund (NCCF) which has received money from the Aged Veterans Fund – £25 million of funding announced by the government last year to help service personnel born before 1950. A launch event will be held at the Victory Services Club, Seymour Street, London on 19 April 2016 at 230pm. The projects come during the 20th anniversary of the Comprehensive Nuclear Test Ban Treaty (CNTBT) established in 1996, a treaty which prohibited all explosive nuclear testing for both civilian and military purposes. The Nuclear Families project being delivered by the University of Southampton, will provide a contemporary approach to understand the lives of the families of British nuclear test veterans. The project will combine methodologies across the social and human sciences to explore this unique group. A new review of relevant literature will provide objective historical and social context to the study. A series of semi-structured interviews will be implemented to tackle themes pertaining to well-being, welfare, family dynamics, mental health, disability and stigma. Focus groups will be conducted to gain insights into group dynamics, thoughts and feelings, within the context of the cohort gaze. Finally, an ethnographic approach will provide a uniquely subjective overt participant observation of the family experience, in contrast to the other research methods. This programme of research will be complemented by demographic data and social media discourse, to contextualise the experiences of the cohort. This project, being delivered by Brunel University London, will carry out chromosomal analysis of cells from nuclear test veterans and their children. The purpose of the study is to examine for any cytogenetic alterations and, to ascertain if there are any differences between nuclear and control family groups. Combat Stress, The veterans mental health charity, will conduct a comprehensive psychological examination of members from the nuclear community and develop a treatment program to be delivered within clinics by suitably qualified and professionally registered Psychiatrists, Psychologists and Therapists. The project will be developed and delivered with the requisite Clinical Governance policies and procedures, with outcomes being measured. The creation and installation of two stone benches for the BNTVA Memorial sited at the National Memorial Arboretum. The benches will help complete the aesthetic appeal of our new memorial as well as providing a resting point for our visitors and a new home for a selection of brass plate dedications salvaged from former nuclear test memorials. The NCCF will manage this fund to facilitate the Individual provision of items, adaptations and services designed to ease suffering, enhance wellbeing and social inclusion that are not available from the public health service or social service provisions. The provision will be subject to identified need screening within the nuclear survivor community.